Even before Game 1, this year’s World Series was set to go down in history. Those lovable losers, the Chicago Cubs, were back in the World Series for the first time in 71 years. Their foe? The Cleveland Indians, owners of the second longest ringless streak in Major League Baseball. A team that had reached the Fall Classic only twice in the last 60+ years, from a city that “won” its first championship in 52 years just four months prior. It also pitted two former allies and fellow curse-breakers against each other. When the Red Sox broke the Curse of the Bambino by going 8-0 in two separate World Series, they were built by GM Theo Epstein (who joined the Cubs as president of baseball operations after the 2011 season) and coached by manager Terry Francona (who joined the Indians after the 2012 season). Basically, one of these teams would break their drought, and one of these champion leaders would take their first World Series loss. However the final result made you feel, the second half of the series was undeniably thrilling. The series looked as if Chicago’s season would once again end in disappointment. The Indians went up 3-1 after a dominant 7-2 victory. They would get at least two chances to close it out at home despite the Cubs managing to hang on and win Game 5. Sure, Chicago had made a couple of those games close, but nobody pulls off a comeback down 3-1. Game 6 flipped the series on its head as the Chicago bats finally came alive. Indians starter Josh Tomlin was charged with 6 runs on only 2 1/3 innings pitched, and the offense couldn’t keep up against Jake Arrieta. In the process, Addison Russell hit the 19th grand slam in World Series history. No big deal, right? Cleveland still had another shot to close it out. Not so fast. Game 7 happened and will undoubtedly be consider one of the best games ever played, even if there hadn’t been epic championship droughts involved. Dexter Fowler hit the first ever Game 7 leadoff homer in World Series history, and the Cubs were off to a 1-0 lead. This was quickly turned to a 1-1 tie, then 3-1 Cubs lead which ballooned to 5-1. It looked like they would finally win it, but the Indians weren’t rolling over yet. It became a 6-3 game going into the eighth. The eighth was action packed. Brandon Guyer had an RBI double followed by a Rajai Davis homer to tie the game. The game had become an instant classic. Game 7 would go to extra innings for the fifth time in history. The rain delay right before extras just added to the anticipation and excitement. The Cubs entered the 10th inning pumped up after a team meeting during the rain delay, and wasted no time scoring two runs. The Indians started to respond, pulling within 1 again, and had the winning run at the plate. Unfortunately they failed to extend the game any further. Carl Edwards Jr.got his third career save, the closer (Chapman) got the win, and the Cubs completed the sixth ever comeback from a 3-1 World Series deficit. A battle between former curse-breaking allies against each other ended after the first ever Game 7 leadoff homer, a blown save that turned into a win, what might be the only Game 7 rain delay, the fifth ever extra innings Game 7, and a pitcher working on his third career save closing out the sixth ever 3-1 World Series comeback to end a 108 year championship drought. It doesn’t get any wilder than that. The Balson family reunion was held at my cousins cottage this time around and we were treated to my cousin Gord’s hobbie of restoring Shepherd boats. He has two. The first is a 1949 speed boat and the second is a 1954 cabin cruiser. Checking on the pictures you will hopefully be as impressed with the work as I was. These boats are truly works of art and should be treated as such. They still move out on the water of Balsam Lake though Balsam Lake is at the top of the Kawartha Lakes chain and has been a great cottage spot for generations. I am not sure exactly how long my cousins family has been on the lake but somewhere around 70 years might be close. In All it was a great day and I must give a shout out to my cousin Gord on the great job he did on restoring these vintage Shepherd Boats. What beautiful work. So now that these are complete, what might be the next restoration job to be undertaken. Part of the problem is finding the old Shepherd Boats to begin with before restoration can even begin. No Shepherd Boats have been made for quite a few years now but 50 years might not be far off the mark. But I am not sure. Maybe someone could correct me if I am wrong. Sorry it took so long to put this together but my blog platform was giving me grief and not loading the pictures properly and without the pictures of the Shepherd Boats, why bother with writing the article. As the saying goes, a picture is worth a thousand words and looking at the pictures, I am sure you would agree. The World Cup is over for the Canadian women in the sports news and sports on the web. They made a valiant effort on a comeback at B.C. Place but came up just short of their goal on reaching the World Cup semi-finals for the first time..
Nerves were the main enemy of the Canadian side as an early miss just over the crossbar could have given them an early lead. Then two defensive brain cramps and the next thing you know the ladies are down 2-0. Goals by Jodie Taylor and Lucy Bronze before the game was fifteen minutes old more or less sealed Canada’s fate of not getting to the semi-finals of the World Cup for the first time ever. After the two quick strikes, England became much more defensive and did not give Canada many chances to score. Christine Sinclair got one back for Canada just before the half ended but that was as close as they could get with England’s staunch defensive play. With the win England advances to the semi-finals of the World Cup for the first time. England will play Japan in one World Cup Semi-final while Germany and the United States will square off in the other. So if you go completely by rankings, Germany should play Japan in the World Cup Final and win it. But that is the beauty of sports. Some strange things can happen along the way and that is why you play the games. Canada might be out of the World Cup for this year but with all of the young talent coming through the ranks, the future looks bright for women’s soccer in Canada. Who knows, maybe a World Cup is in the countries future. It’s too bad the Men’s program is not at the same level. And that’s the sports news and sports on the web, or the way I see it anyway. The Chicago Blackhawks are the Stanley Cup Champions for the 2015 NHL season in the sport news and sports on the web. The Hawks defeated a very strong and youthful Tampa Bay Lightning team in six games, which just happened to be what Allsports predicted before the Stanley Cup Final began. You could verify that with Allsports previous post. In fact, Allsports did a pretty good job in the prediction department for these Stanley Cup playoffs. There are a total of 15 Stanley Cup playoff series that take place in order to get the “Holy Grail” of Hockey into your hands. Eight in the first round, which is toughest because the teams are all so evenly matched. Then four, two and one respectively. Allsports numbers were 5 of 8, 4 of 4, 2 of 2 and one as Chicago was picked to beat Tampa in 6 games. In fact Allsports was correct in the number of games not only in the final, but in the two Conference Championships as well. These facts can all be verified if you look back through the posts for these Stanley Cup playoffs and notice the time stamps on the posts that prove the predictions were made before each Stanley Cup playoff series began. In fact Allsports usually does pretty well in the prediction department, no matter what sport is being played. So if you would like some advice on betting the odds on sports events, Allsports in available for a small fee. In total Allsports picked 12 of 15 Stanley Cup playoff series correctly, not a bad winning percentage. But I have digressed with my blatant self-promotion, but if you don’t do it who will. So now let’s get back to what actually happened in the Stanley Cup Final. How did the Hawks persevere and get by a plucky, skilled Tampa team that was the highest scoring team in the league this year. 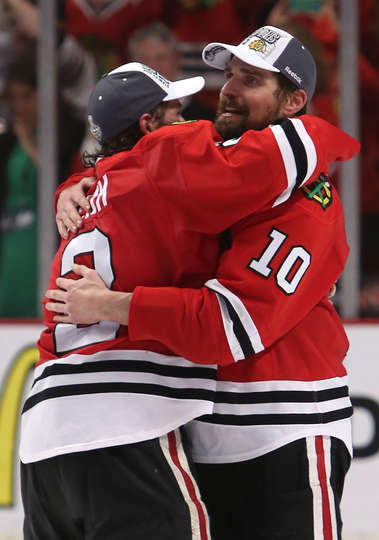 Well first Chicago was stronger down the middle, winning better than 60% of the face-off’s in the Stanley Cup final. This percentage grew as the series progressed. So Chicago usually started with the puck and Tampa had to chase the game. The hand injury to Tyler Johnson in game one did not help Tampa’s cause down the middle and ultimately helped Chicago. Johnson, who was leading the playoffs in scoring when the Stanley Cup final began, became ineffective after the hand injury.